While Apple itself does not unveil any sales figures, we usually get a good idea from various analytic companies. Seemingly, Strategy Analytics has released a set of numbers in which it states that the Cupertino giant has managed to sold 3.5 million Apple Watch units in the first three months of calendar 2017. While the company sold 2.2 million units of the wearable in the same three month time period last year, it suggests a massive 59 percent annual growth. So, let’s dive in to see some more details on the sales figures and where does Apple stand in the wearable industry at the moment. 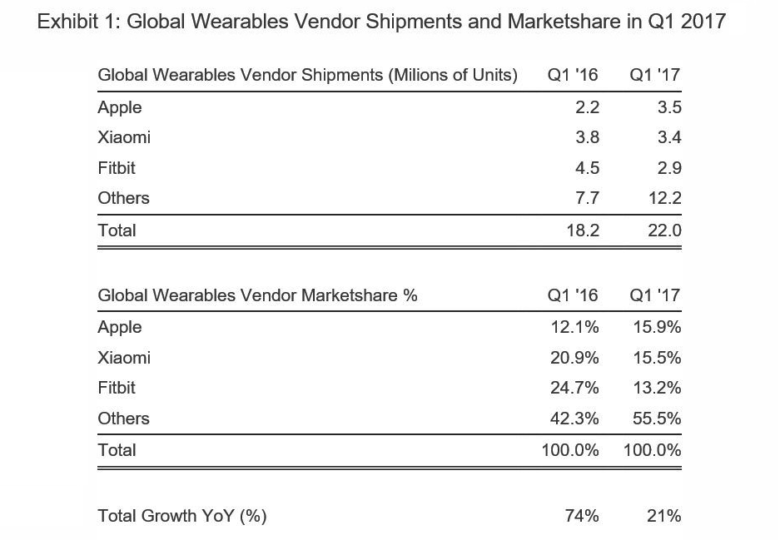 According to the details shared, the global wearable shipments during the first quarter of 2017 rose to 22 million. This is an increase of 21 percent compared to the first quarter of 2016. Apple’s achievement of 59 percent growth saw the company capturing 16 percent of the total wearable market share. With that said, Apple has overtaken Fitbit to become the world’s largest wearable vendor. “Apple captured 16 percent global marketshare and overtook Fitbit to become the world’s largest wearables vendor. The new Apple Watch Series 2 is selling relatively well in the US, UK and elsewhere, due to enhanced styling, intensive marketing and a good retail presence. In comparison to the Apple Watch, Fitbit saw a decline with just 2.9 million units selling in the first quarter of 2017. Comparatively, in last year’s first quarter, Fitbit sold 4.5 million units. So even though Apple has surpassed Fitbit in terms of sales, it is still not as big as Fitbit was in the previous year. Another note worthy vendor in the list is Xiomi with its Mi Band which has managed to capture 15 percent of the market share, selling an impressive 3.4 million wearables. Check out the chart for more details. During Apple’s recent earning call, Apple’s CEO Tim Cook talked about the performance of the Apple Watch, saying that the company saw the shipments double year-over-year. In addition to this, Tim Cook also attributed the impressive gains of the Apple Watch due to features like fitness and health tracking. There will be more to the story, so be sure to stay tuned in with us. As for now, what are your thoughts on the recent sales figures of the Apple Watch? Are you an Apple Watch fan? Share your thoughts with us in the comments.